In keeping with our Mission Statement, the law library strives to innovate its services and collections to meet the evolving research needs of the Colorado legal community. Our goal is to assist Colorado legal researchers through improving our collections and services and developing our profession. Since 2012, the law library has sponsored a fellow program which provides valuable training and experience to a newer librarian, and enables the library to pursue innovative projects. 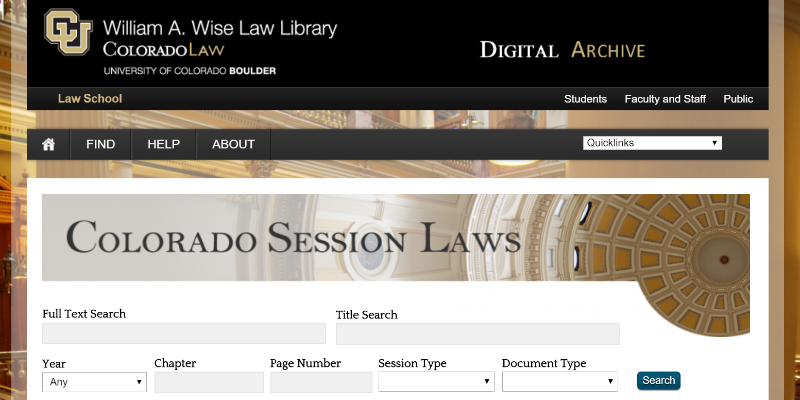 Such projects include the digitization of the David H. Getches Collection, a redesign of the law library website, the development of an online collection of Colorado Session Laws, and the creation of legal research guides. The fellow also contributes to the rich body of legal research instruction provided by the law library, and helps develop new pedagogical approaches. The Boulder Conference is a gathering of law librarians who meet to critique scholarly works-in-progress and to develop a pedagogy of legal research instruction. The conference has met annually since 2009. The first conference was held at the University of Colorado Law School's William A. Wise Law Library in Boulder, Colorado. In 2012, the law library began digitizing the works of the late Dean David H. Getches to capture the work of this important figure of Colorado legal history. Since the creation of this collection, we have digitized millions of pages of Colorado law, and academic writings of the law faculty. Our collections include the Colorado Session Laws, the Colorado House and Senate Journals, Colorado Supreme Court Briefs, the Arizona v California litigation, and the works of the Getches-Wilkinson Center. We continue to look for opportunities to make available these materials for Colorado legal researchers and historians of the law. The law library is always looking for partners to help us achieve our mission of providing a world-class research facility for the Colorado legal community. There are many ways you can help. We look forward to hearing from you.